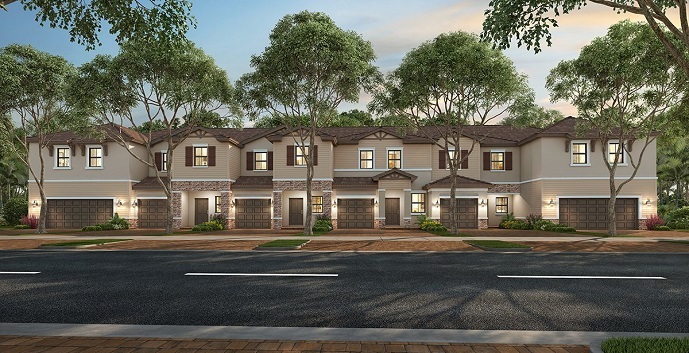 Palomino Lake by Lennar Homes is offering new and exciting townhomes coming to the Davie area of Broward County. Palomino Lake consists of 6 floorplans of nicely appointed, Mediterranean styled two-story townhomes with either 2 or 3 bedrooms and 1 or 2 car garages ranging in size from 1443 square feet to 1792 square feet. The two bedroom models will also feature a den for added living space. All units will also come with Lennar’s Smart Home Technology to wirelessly cooperate with Amazon’s Alexa. The interior finishes at Palomino Lake will include designer features as part of Lennar’s Everything’s Included Program. The community of Palomino Lake will offer its’ residents close proximity to major roads, retail areas and is just a short drive to the famed South Florida beaches. Palomino Lake offers 6 models to chose from. Arlington - 2 story townhomes with 2 bedrooms, 2 and 1/2 bathrooms, great room, family room, upstairs den and 1 car garage. 1,443 sq.ft. Belmont - 2 story townhomes with 2 bedrooms, 2 and 1/2 bathrooms, family room, living room, dining room, upstairs den and 1 car garage. 1,597 sq.ft. Del Mar -2 story townhomes with 2 bedrooms, 2 and 1/2 bathrooms, great room, living/dining room and 1 car garage. 1,697 sq.ft. Keenland - 2 story townhomes with 3 bedrooms, 2 and 1/2 bathrooms, great room, living/dining room, upstairs den and 1 car garage. 1,697 sq.ft. Santa Anita - 2 story townhomes with 3 bedrooms, 2 and 1/2 bathrooms, great room, upstairs den and 2 car garage. 1,792 sq.ft. Whitney - 2 story townhomes with 3 bedrooms, 2 and 1/2 bathrooms, great room, upstairs den and 2 car garage. 1,792 sq.ft.